What is Headless Mode on a Drone (with Pictures) & How does it work ? Headless mode represents a specialized flying mode that is present on virtually all entry level drones available on the market. 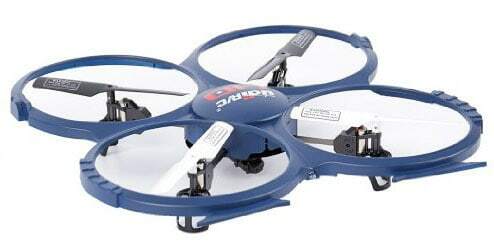 It eliminates the need for focusing on drone’s orientation and enables a much easier Line of Sight flying experience. This is even more true for beginners whose main problem is getting their control inputs to align with their drone’s current orientation. Being unable to tell which part of the drone is the front and which is the back is how most beginners’ crashes happen. But, thanks to headless mode, beginners can easily control their UAV in all directions since this feature tracks the drone’s orientation with its transmitter and not its general in-space orientation. In layman terms, no matter where your drone’s front side is pointing, pressing left on the transmitter will always make the drone go left in your current point of view… In other words, headless mode takes commands in relation to your current orientation and not its own. This would, of course, not be the case with normal mode when your drone’s front side points towards you – if you press left, it will go right. I hope that now you have a right answer to your “What is headless mode” question ? How to activate headless mode? Now when we know what does headless mode mean, let’s find out how to activate it ! Unfortunately, for this question there isn’t a “one answer fits all” scenario. Instead, all drones use different methods for activating the headless mode. Still, they’re all fairly simple and include just one push of a button in order to get it to work. However, there are some models which have headless mode hidden away. So, if you cannot find it anywhere and you’ve already pressed all of its keys… then it might be activated with a long press. For that, I suggest you go ahead and get informed by reading the manual. I’m sure you will find an illustration of your controller as well as the explanation on how to activate the headless mode. Truth be told, the majority of mainstream drones today come with headless mode. And it’s not even that surprising considering it’s so damn popular. People love it due to the fact it provides them with clean and easy controlling in contrast to normal (or God forbid acro mode) mode… And that’s exactly why I’ve come up with 5 awesome drones that sport headless mode. 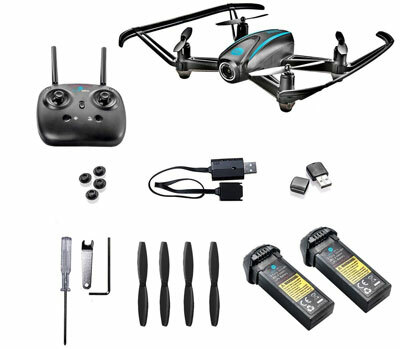 As you will see below, each of these drones is highly beginner-friendly (check out more beginner-friendly drones) and aren’t expensive by no means. As a matter of fact, they can all be considered as toy-grade models… except perhaps MJX Bugs 2W which can help people venturing into professional aerial photography line of business. Syma X5C-1 is a drone which comes in 2 different versions. One will set you back for slightly over $20 but comes as a BNF model without a camera or charging cable. The second version will set you back by double the money but sports a controller, 2GB SD card, charging cable and a miniature camera. Starting off with the features, Syma X5C-1 obviously sports headless mode. On top of that, it also features 360 eversions (continuous flips) which can be considered as icing on the cake. Camera-wise, Syma X5C-1 has received an upgrade in the form of an HD-ready sensor. More precisely, this miniature camera can record videos in 720p which it saves on the provided 2GB MicroSD card. But, when it comes to flight stability, that’s where this birdie shines the most. Thanks to a great transmitter and fast flight controller, maneuvering with Syma X5C-1 is a breeze. Controls are responsive and specialized flying mode for beginners makes thing a lot easier for first-time flyers. Specifications are not a downside either. Syma X5C-1 runs on a 1S 500mAh LiPo battery. It takes around 1 and a half hour to charge it up and it can provide approximately 6 minutes of flight time. Not a lot, I know… but getting 5 replacement batteries and a 5 in 1 charger could do you a world of good. Operating range goes somewhere around 30 meters which is by no means bad for a drone costing as little as this. All in all, if you’re looking for a responsive and highly stable drone with a good camera, Syma X5C-1 should definitely be your go-to option! Just by looking at the design of this birdie, you can immediately assume that safety is its number one concern. And it’s true – thanks to a rigid body and thick prop guards stretching across the entire build, UDI U818A (DBPOWER edition) can survive quite the beating. But, can it perform as much as it can survive? Well, that’s exactly what you will be able to find out if you read the next couple of paragraphs! First things first – UDI U818A sports a tiny camera on the bottom. From the looks of it, it seems to be a 2MPX sensor capable of recording in solid 720p and do so at steady 30 frames per second (fps from now on). There is no stabilization (hardware nor software) onboard so you will have to manually keep it steady if you want smooth shots. We are talking about 1S 700mAh LiPo batteries, each of which can produce anywhere from 6 to 9 minutes of airtime. So, with 2 batteries in 1 flight session, you will be flying for roughly 15 minutes give or take. Operating range is outright awesome. It stretches all the way to 80 meters in clear and unobstructed areas. However, if you’re flying it in an area filled with trees and tall buildings, you will be getting only around 50m. As far as FPV range is concerned, it keeps steady until the 30-meter mark. The third spot on Best Headless Drones list goes to the one and only Altair AA108. Many of you haven’t even heard about this drone and I cannot start to explain just how awesome it is. While we are already talking about the camera, I should tell you right off the bat that it’s basically a 2MPX sensor, very similar to the 2 above. However, thanks to a spectacular flight stability and the perfect camera angle, Altair AA108’s camera performs way better than others. There’s not a lot of jello in aerial videos (in 720 @30fps) plus selfies are pretty clean as well. So, if you’re looking for an entry-level drone that will boost your selfie game, I reckon you should give Altair AA108 a go. You will also get an extra battery as well as a spare set of props to help you save money after your first couple of crashes. 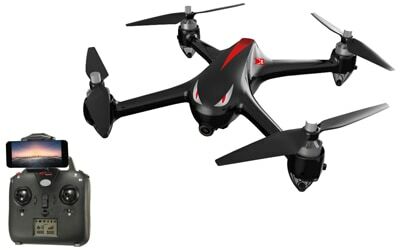 Additionally, I should also mention that Altair AA108 sports FPV, headless mode (obviously), 3-speed modes, altitude hold and even out of range/low battery alarm to help you find your drone if you happen to lose it. Specifications-wise, Altair AA108 is looking like a proper beast. Thanks to a powerful LiPo battery and lightweight design, its flight time can go up to 10 minutes with normal use. Operating range doesn’t fall too much behind more expensive models – roughly 100 meters. FPV range, on the other hand, is roughly half of that… which is still not bad considering the price tag Altair AA108 sells for. There’s no doubt that DROCON did a great job with UDI U818Plus model. It’s surely amoung the best toy-grade quadcopters currently available on the market. With solid performance, great camera and, of course, headless mode… this birdie is a safe haven for all first-time flyers. But still, it falls short of MJX Bugs 2W who is able to offer plenty more than just a safe flying environment for beginners. But, more on that one at the top spot below. For now, we will be focusing on DROCON UDI U818Plus and why is it such a good toy-grade headless mode drone option! First of all, I would like to say a couple of good words about this birdie’s controller. It fits nicely into hands and sports a sleek rounded finish that feels just great. It’s quite responsive as well… but is, unfortunately, made out of cheap materials. However, it serves the purpose great, and at the end of the day, that’s what matters the most. Features-wise, UDI U818Plus incorporates altitude hold, headless mode and one key landing/takeoff which could provide a great deal of help to first-time flyers. The camera is not half bad either. As a matter of fact, it’s one of those 2MPX sensors capable of recording in 720p… just like the ones we’ve already seen above. Last but not least – specifications. DROCON actually did a pretty good job of upgrading the basic specs of this little fella. So, in terms of flight duration you are looking at 10 to 15 minutes… roughly 12 minutes on average and with normal use (not going full speed forward all the time). Operating range is nothing short of brilliant. Believe it or not, DROCON UDI U818Plus can reach up to 150 meters away from you. Pretty sick coming from such a cheap drone, don’t you agree? I already gave you the assumption that MJX Bugs 2W is by far the best option in this entire list. And it’s true… But it does come at a slightly higher price than other models as well… Still, if we were to look at the best value for money ratio, it would be hard to get this birdie off the throne. Why? Well, there are just so many great things about it that I don’t know where to start off… Hmm, perhaps camera would be a good entry point. For those of you who did not notice, all 4 models above sport roughly the same 2MPX sensor capable of recording at 720p. However, MJX Bugs 2W takes its photography game up a notch by featuring what seems to be a 5MPX sensor that records in full HD. The stability is second to none. Generally speaking, I firmly believe you will love what MJX Bugs 2W has to offer in terms of aerial photography. Moving onto the features and it’s safe to say they are nothing short of brilliant. 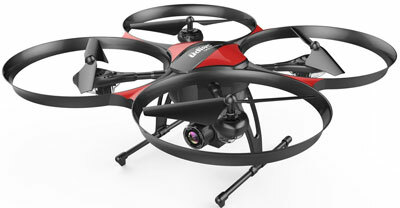 First of all, this is the only drone from this list that features a GPS module which provides access to features such as return to home and altitude hold. These are both great, especially the latter which will do you a world of good when capturing aerial photos and videos. FPV is present as well, and it works up to 200 meters which is good news coming from an entry-level model. We already started talking about numbers so we might as well continue. The operating range of MJX Bugs 2W is not shy of high-end drones, coming in at up to 800 meters. That’s quite an increase over its spiritual predecessor MJX Bugs 3 which could achieve only 300m. As far as battery duration is concerned, you can expect somewhere around 15 to 18 minutes. Not bad… Not bad at all! How reliable is headless mode? Now when we know what is headless mode on a drone, let’s talk about its reliability. Believe it or not, headless mode actually has no issues with reliability. It is not affected by range, motors, power, battery or anything else of such nature. Instead, it is basically a controlling protocol just like standard flying is. With that being said, you can expect the same controlling accuracy without any degradation by any means. What are the benefits of flying in headless mode vs normal? As it has already been stated above, drone headless mode has several benefits over flying in normal mode. However, they are all primarily targeted at beginners and generally to people who can’t properly control a drone in the normal mode. As a matter of fact, if you already know how to do an S-curve with your drone when it’s not pointing directly towards you, then I suggest you avoid using headless mode. 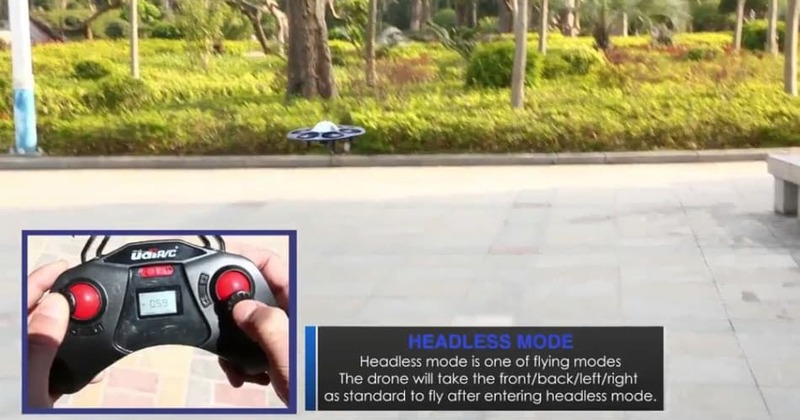 By using headless mode you will have a much easier time getting the grasp on how controlling drones works. Without the need for focusing on its front side, you will be able to do all sorts of flips like never before. Of course, since headless mode provides an easier learning curve, it comes as no surprise that there will be a lot fewer crashes going on. Less spare parts to purchase as well, and we can all agree that’s a big plus. Well, if you ask me… I suppose headless mode is a great way for complete beginners (read first-time flyers) to practice flying their newly purchased (or gifted, I guess) drones. It enables a much smoother learning curve without constant crashing that could result in premature drone defects. But first, take a look at our photo illustration of “what is headless mode” on the top of this guide. Driven by those thoughts, I should also say that there are many people (my colleagues too) who are highly against headless mode. Their main argument is: It learns people wrong controlling method and makes it more difficult to learn flying in normal mode. To be honest, their argument stands true… but despite it, I still believe beginners should use headless mode. Many of them won’t become FPV racers or professional drone operators and they’re just looking for some fun. With that said, if headless mode provides them with an easier solution to that, why shouldn’t they use it? Headless mode relies on a tiny sensor found inside of drones. It’s known as a magnetometer and enables drones to tell which direction it’s supposed to be flying. Magnetometers, in practice, are highly accurate… but have one major flaw – if they find themselves near powerful electromagnetic fields, their accuracy goes downhill and makes the drone mess up its orientation. This usually happens when you fly with headless mode on near powerlines or similar areas with strong electromagnetic fields going on. It was stated at the very start that headless mode gathers the majority of entry-level drones. 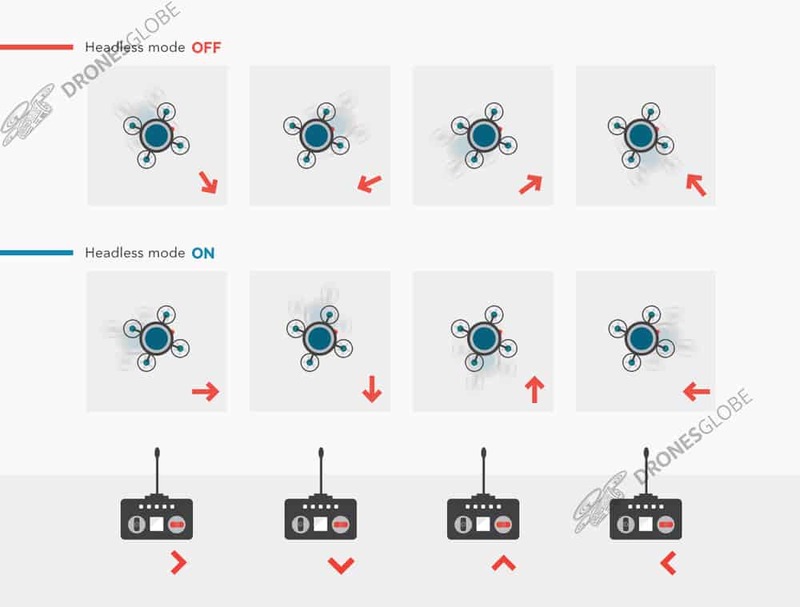 Slide the bar to mid-end and you’ll still have a majority of drones featuring headless mode. However, some high-end models, as well as all commercial ones, usually don’t invest in headless mode. So, if you ever decide to fly a more expensive birdie, chances are high you’ll have to give up headless mode… And my oh my, getting your brain muscles to reset to default after years of headless mode controlling can be a tough break. Unfortunately, headless mode will simply not work while you’re flying in FPV. The reason is rather obvious too – in FPV mode you will be viewing the scene from your drone’s from perspective. With that being said, there’s no real reason to turn on headless mode as you will be looking at your drone’s camera perspective at all times. Turning it on would result in an unimaginably terrible experience… and crashes… lots and lots of crashes! Is headless mode considered as cheating? Well, it kind of is. Using headless mode gives you direct control of your drone without the need to constantly pay attention to its orientation. It’s much easier than normal mode, that’s for sure… so I guess it can be considered as cheating. But looking at the grand scheme of things, it is exactly the opposite of that. How? Well, if you ever decide to fly a more expensive drone (for example, a drone for industrial use) you would have a terrible time since most of them don’t support headless mode… and your brain muscles have gotten used to it. Check out Limitations of headless mode if you haven’t already, it will shed some more light on this topic. That’s why I’d like to conclude by thanking you for reading this with the hope that it shed some light on the topic. The term Headless Mode can seem somewhat confusing to first-time flyers so this sort of an article could do a great deal of help. Anyways, I hope you enjoyed the list. Until next time… Happy flying!